The MT8050iE is a 4.3" Touch Panel Color Display and HMI with built-in Ethernet, a USB 2.0 Host port, and a DB9 serial port for RS232/RS485 communication. 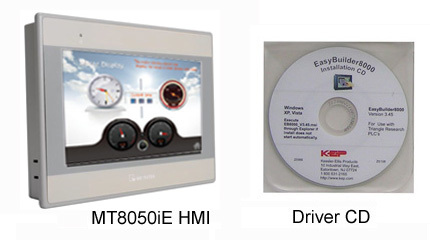 It ships with the EBPro software CD that includes the TRi PLC drivers. If the connection between the PLC and HMI will be via serial instead of Ethernet, a serial interface cable to a Trilogi PLC has to be separately ordered (Cable-6050 under "Adaptors and Connectors") but is automatically included free when ordered with Trilogi PLCs. The MT8050iE is suitable for applications and OEM automation that require color graphic displays and manual interfaces. Triangle Research International, together with its technology partner: Kessler-Ellis Products, has developed a special driver for this low cost, high resolution LCD touch panel to communicate with the TRiLOGI Super PLCs (Nano-10, FMD, F-series and M-series) using the Native protocol. Although the Super PLCs' inherent support of MODBUS protocol means that any off-the-shelf MMI that supports Modbus protocol can be used with the Super PLC, these are however limited to accessing the data as 16-bit Modbus words only. The KEP MMI's support of the native protocol allows direct access to all the variables inside the Super PLC without the need to refer to a Modbus memory map table, thereby simplifying the development of Touch panel program and increasing its flexibility. - Display Size (Diagnal): 4.3"
- Backlight Life Time: 30,000 hrs.